Fats, oils, and greases (FOG) can build up in sewer pipes and your plumbing, clog your drains and put your home at risk of sewage back-ups. The FOG builds up in wastewater treatment infrastructure too, causing equipment to break down. Each year, considerable resources are spent cleaning grease-clogged pipes and equipment throughout the municipal wastewater treatment system. Meats, sauces, gravies, salad dressings, deep fried dishes, dairy products, soups, chili, pastas, pastries, butter and margarine are all foods that contain fats, oils, and greases. DO scrape grease and food scraps from plates, pots, pans, utensils, grills, and cooking surfaces and place them in your Green Bin. DO wipe out greasy pots, pans, and utensils with paper towel before putting them into the sink. Soiled paper towels can be disposed of in your Green Bin. 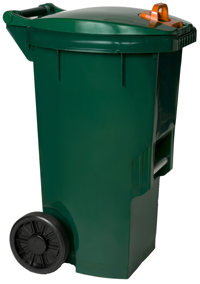 DO place grease and food scraps into your Green Bin. 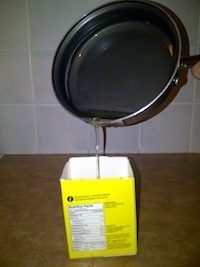 Pour grease, fat, or lard into a clean juice carton with the top cut off. Let the material solidify and then place in your Green Bin. DO use a strainer in the sink to catch food scraps and other solids. DO inform family members, friends, and neighbours about the problem with FOG in the sewer system and how to keep it out. DO NOT pour grease down the sink or into the toilet. DO NOT rinse grease down the sink. Hot water is not the solution. Once the grease and water cool, the grease deposits onto the sides of the sewer lateral or municipal sewer pipe, blocking them over time. DO NOT use cloth towels or rags to wipe off plates or clean greasy dishware. When the towels are washed, the grease ends up in the sewer. Avoid this and other complications!